Welcome to our 25th Anniversary page! Two and a half decades ago, a group of visionaries began an effort to share data and find out how their neighbors were faring, block by block. As described below, over 100 public and private organizations across Connecticut now use DataHaven's work to measure key areas such as health, education, civic engagement, and economic opportunity over time, so that programs and resources can be deployed to change lives for the better. In 2018 and 2019, DataHaven is celebrating its milestone anniversary with support from the 25th Anniversary Honorary Committee and 25th Anniversary sponsors. Get involved by sponsoring or attending an upcoming event, signing up for our newsletter, or helping us share the many new public reports we'll be releasing this year. Learn more below. Visit this page to view and download our 25th Anniversary report, released on November 19, 2018. 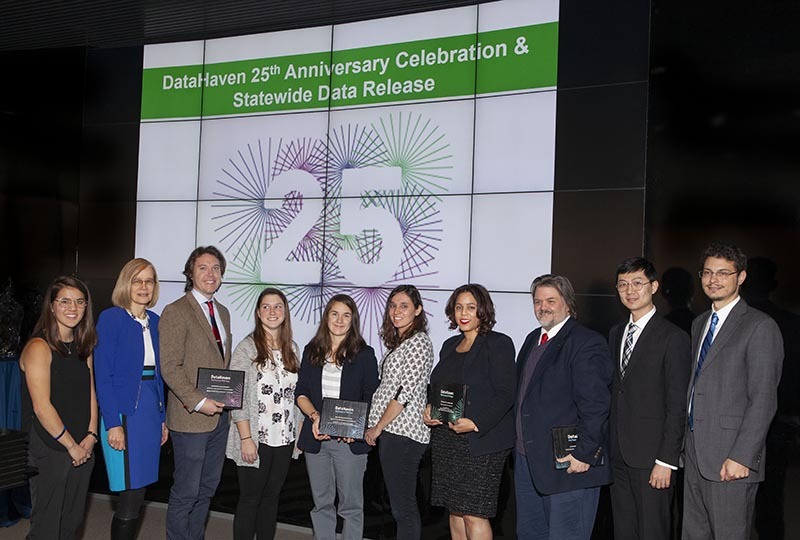 The DataHaven 25th Anniversary Honorary Committee consists of respected leaders whose participation will help us celebrate our first 25 years, and set the stage for the next quarter century of uniting Connecticut through high-quality data. Special thanks to the Committee! Our 25th Anniversary Celebration and Statewide Data Release Event took place on November 19, 2018. Data from the DataHaven Community Wellbeing Survey, including preliminary information shared at the event, is posted on the main survey program page. Read the event program, 2018 DataHaven Innovation Awards winners, and Anniversary report here. Image above shows the audience at the event (photo credit: Harold Shapiro). We are grateful to our quartet of Presenting Sponsors – who happen to also be our four founding organizations from 25 years ago! They are the City of New Haven, Yale New Haven Health, the Community Foundation for Greater New Haven and Yale University. Additional sponsors will be announced. Scroll down to learn more about sponsorship opportunities. DataHaven will be organizing additional regional and statewide events in 2019, including an Anniversary "closing" event and award ceremony for the 2019 DataHaven Innovation Awards. Information will be posted here or in our newsletter when it becomes available. As part of DataHaven’s 25th Anniversary, we are proud to highlight the creativity and ingenuity of individuals and groups who employ data to make Connecticut a better place. The 2018 DataHaven Innovation Awards were presented by Liberty Bank Foundation. 2018 Awardees are announced in our 25th Anniversary report. Award winners from L to R include representatives from Clifford Beers Quality Analytics & Research Department, Conservation Training Partnerships Program at UConn NRCA, Carolyn Streets of Engineering & Science University Magnet School, and New Haven Promise. Photo credit: Harold Shapiro. Nominations were due October 1, 2018 and dozens of excellent nominations were received. Awards were given in two areas: Data for Community Impact Awards to recognize the outstanding use of data to make a positive difference in one or more Connecticut communities and Data in Education Awards to recognize the outstanding use of data for projects developed within a classroom or educational setting. Thank you to everyone who nominated an organization or educator for this award! Check back in mid-2019 for a call for nominations for next year's awards. We've been a partner for a number of years, recognizing the huge value of that having this kind of neighborhood data can be to foundations in understanding... read more We've been a partner for a number of years, recognizing the huge value of that having this kind of neighborhood data can be to foundations in understanding the communities in which they want to give and to help them evaluate their work over time. DataHaven is a valuable organization and not every state has something like this; it’s quite special. Please contact DataHaven for information. We are seeking additional organizations that wish to help sponsor our 25th Anniversary events (see above for a list of sponsors committed to date), and various sponsorship levels are available. If you would like to make a small individual gift, you may do so here. Sign up for our newsletter or view our social media pages for more information. Click here to learn more about some of the organizations that support DataHaven.